There are a lot of options today for selecting a cloud partner for bioinformatics, and the big guys seem to all have a one-size-fits-all approach, since they serve a variety of industries. Clouds that were designed to handle less data-intensive, mass-market consumer tasks such as file and photograph storage, video sharing/streaming, database hosting, and web application deployments are not clouds that are optimal for processing complex tasks, such as those required for next-generation sequencing. Plus their cost structures are such that fees related data transfer, computing, and storage can quickly spiral out of control, especially when you’re dealing with peta-scale data. With this in mind, L7 Informatics worked with our partners at IBM Bluemix Cloud to build a new cloud environment from the ground-up. Using IBM’s capacity for mix-and-match provisioning of resources in each of its global data centers, we were able to create the High-Performance Genomic Cloud specifically to handle data-intensive scientific workloads. 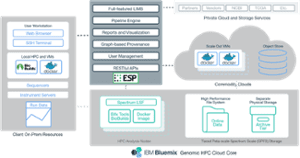 Using a combination of IBM Spectrum LSF, IBM Spectrum Scale, and 10g internal networking, all run by L7 Informatics’s Enterprise Science Platform, the Genomic Cloud represents the industry’s fastest and most cost-effective cloud computing resource for scientists. If you’re interested in digging more into our solution, I invite you to check out the our Genomic Cloud White Paper. If you’d like answers to specific questions, I invite you to contact us anytime, and we’ll be more than happy to chat!